Available from KRSS a used fully refurbished Thermo Orbitrap Velos Pro. Installation and 3 months warranty included (extended warranty available). 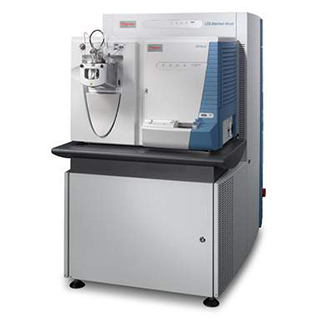 The Thermo Scientific Orbitrap Velos Pro hybrid ion trap-Orbitrap mass spectrometer features dual-pressure linear ion trap technology that delivers increased sensitivity and dynamic range with ultimate robustness. With the Thermo Scientific Velos Produal-pressure linear ion trap front end, rapid scanning enables higher productivity and Generation II optics with neutral blocking technology provide enhanced ruggedness for the system. The outstanding high-resolution, accurate-mass (HR/AM) data quality and sensitivity of the Orbitrap Velos Pro™ system, whether using CID, HCD or optional ETD fragmentation, makes it ideal for identification of low-level proteins in complex matrices, rapid quantitation of isobarically labelled peptides and structural elucidation of metabolites.